Best Succulent Containers Contest 2013 - we have a winner! Back by popular demand - the Best Succulent Containers Contest especially for those thoroughly addicted succulent gardeners; brag up your favorite combination of plants, in your thoughtfully planted weird, unusual and different container. Share your unique ideas to display your tender succulent plants and whatever else fits into the category of 'succulent plant' - they can be hardy Sedum or Sempervivum, the hens and chicks, or mix and match; then choose, combine, and create. Rustic salvage, and funky planters made from hypertufa, driftwood, glass or any other material recombined and upcycled are where it's at lately; think outside the box, use your imagination! Sign up and watch for the announcement in Xeria. 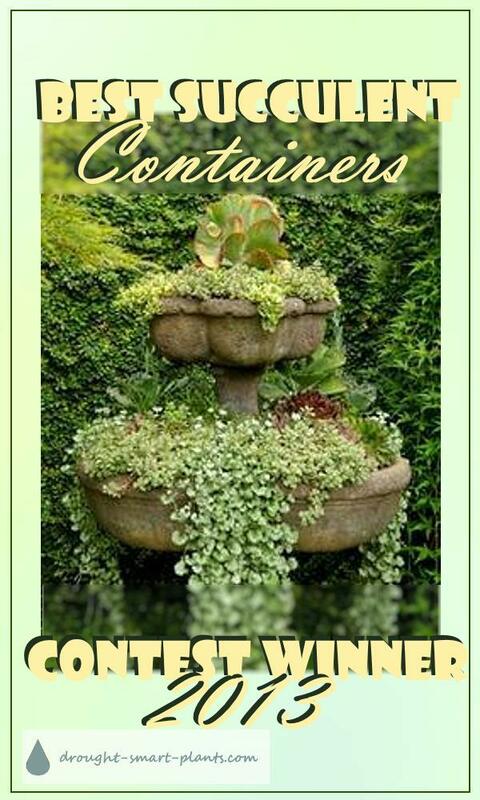 There aren't many rules, but please check them out here: Best Succulent Containers. The waiting is over! The judges needed some time to tabulate all the votes, inspect closely all the entries, and then will make their decision. Our winner is Planting Succulents, by Brenda. She's done a beautiful job in combining succulents and other drought tolerant plants in some unique and interesting ways. Well done, Brenda! I'll be contacting you to check your preference of prizes, so watch for that. If you haven't already, go and sign up for the Xeria E-Zine for the next contest. ...so natural in wicker baskets! A vintage grape vine basket that I've had for years... .. .
Made the container for the succulents out of chair rail border and scrap wood. Love these head planters!!! So elegant....make different 'hair' pieces with succulents and sedums! !